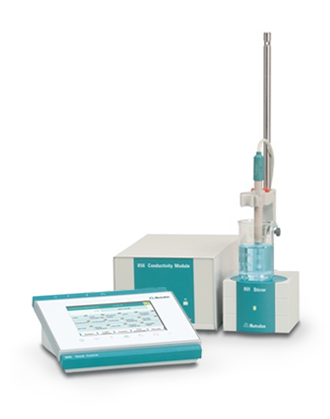 Whether used as a stand-alone instrument or with a Titrando, the 856 Conductivity Module is the latest add-on to Metrohm autotitration systems. The 856 Conductivity Module can perform measurements with state-of-the-art conductivity measuring cells, i.e. with 5-ring measuring cells. With the 856, there is a galvanically separated measuring input so conductivity and pH measurement using a Titrando can now be measured in the same sample beaker. Conductivity titration* and measuring module for upgrading Titrando systems or use as stand alone unit in combination with an 900 Touch Control or tiamoTM 2.3 software. The 856 Conductivity Module can be operated with conductivity measuring cells of the latest technology, the 5-ring cells. They provide for a high linearity without platinisation of the cell. This guarantees highest precision, and the cell constant, once determined, remains stable over a wide measuring range. In contrast to the 4-ring cells, the electrode can be immersed completely into the beaker. Thus, beakers with different filling height are no problem and a rapid mixing within the cell can occur in stirred solutions. Last but not least, the 5-ring conductivity measurement cell is easy to clean thanks to its removable cap. With the help of the optional 6.2103.160 Adapter box, the classical Metrohm conductivity measuring cells can also continue to be used with the instrument. Thanks to the galvanically separated measuring input, pH and conductivity can be determined in the same beaker without interference. The Conductivity Module has 2 USB interfaces for connection of USB printers, barcode readers or sample changers and 4 MSB interfaces for stirrers or 800 Dosinos. Whether operated by 900 Touch Control as a stand-alone conductivity measurement instrument or by PC Control or tiamoTM (from 2.0), the 856 Conductivity Module complies with GLP and FDA requirements.